Vampire Knight is a vampire romance and shojo manga from creator Matsuri Hino. It was published in the magazine, LaLa, from 2004 to 2013. It has been collected in 19 tankōbon (similar to a graphic novel), and VIZ Media has published the series in the United States as a series of English-language, paperback graphic novels. A few years after the end of the original series, Hino began producing a series of “special chapters,” episodes of Vampire Knight that take place after the events depicted in Vampire Knight Volume 19, which contained the final chapters of Vampire Knight. VIZ Media is publishing an English-language translation of the new chapters in the graphic novel series, Vampire Knights: Memories. Vampire Knight focuses on Yuki Cross, who eventually learns that she is a pure-blood vampire. Her first love interest is Zero Kiryu, a human suffering from the curse of the vampire. Yuki eventually falls in love with Kaname Kuran, a pure-blood vampire. At the end of Vampire Knight, Kaname sacrifices his body to create new vampire-killing weapons for the vampire-hunting Hunter Society. As Vampire Knight: Memories, Vol. 2 opens, Kaname experiences the events that occurred during his thousand-year slumber as memories. While Kaname sleeps, Yuki and Zero begin a romance and contemplate marriage. However, vampires begin threatening Zero because he is a vampire hunter, and they do not want him tainting, Yuki, their “pure-blood” princess. Can Yuki and Zero overcome the forces arrayed against them? Meanwhile, vampire scientist and inventor, Hanabusa Aido, begins a doomed romance with Sayori Wakaba, a young human woman. Can either of them really accept the fact that Sayori will suffer the fate of all humans – to die one day, while Zero will not. THE LOWDOWN: As I wrote in my review of the first volume of the Vampire Knight: Memories manga, I did not like the end of the first Vampire Knight manga, especially the “death” of Kaname. In general, however, I really liked the series, and I enjoyed the prettiness of creator Matsuri Hino's art. 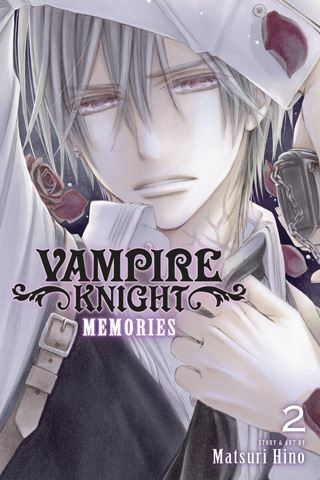 Vampire Knight: Memories Graphic Novel Volume 2 is a little stronger than the first volume. The series is now more a melancholy supernatural romance, purely so. The original series deals with the politics of Cross Academy, a school attended by vampires and humans who did not know that vampires attended. Vampire Knight also focuses on the internal politics and intrigue of vampires and Hunters. The new series is quite a bit different. I like its focus on themes of love, family, and obligation. The five chapters contained in this second volume also deal with how complicated relationships can be and with the fragility of life, especially that of humans. If fans did not get enough of Vampire Knight, Vampire Knight: Memories is a worthy second serving. I READS YOU RECOMMENDS: Fans of Vampire Knight will want the Shojo Beat title, Vampire Knight: Memories.